Hatters defender Alan Sheehan is back in training and back in contention for Saturday’s home League Two clash against Grimsby Town. The summer signing from Bradford City hasn’t played for Luton since joining the club permanently after being forced off moments before kick-off on the opening day at Plymouth Argyle. He suffered a setback to his recovery a few weeks ago, but boss Nathan Jones confirmed he was back up to speed now, saying: “He’s back in full training, we could have pushed him for last Saturday if we wanted to but we didn’t feel we needed to. Meanwhile, Glen Rea is also available once more as he missed Saturday’s 4-1 thumping of Wycombe Wanderers after being called up to the Republic of Ireland U21s to face Slovenia and Serbia. Jones continued: “He’s in good spirits to be fair, he turned up with a pair of bright yellow boots, so he must have had a good time. “It was a slight inconvenience for us the international thing, but we’ve got a squad who can handle it. 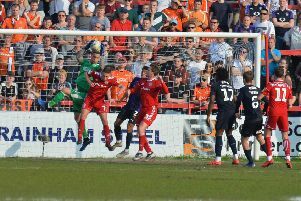 With Luton heading back to the summit in the absence of Sheehan and Rea, when asked if he would now face an awkward selection, Jones said: “It’s not awkward, it’s great to have those options, because I’m very blessed with those options. “But we’ve worked very hard in getting those options because it’s a long season. They will all play games, they know that I love them, they know that I work with them and want them to play. Jones expects the battle to make Town’s first team will on intensify once Danny Green and Craig Mackail-Smith return from their long term injuries too. He added: “We know we’ve got a good squad and there’s real competition and the main thing is keeping everyone happy and keeping everyone focused and motivated, that’s my job.